Copyright ©1999, all rights reserved. Planet Waves Digital Media Project, now including Centaur News Service. Planets. The Sun opposes retrograde Mars and squares Neptune the 23rd. The Sun is conjunct Saturn April 27. The Scorpio Full Moon is Apr. 30. Look alive. I'd been searching the universe for a decent theory on "passive aggression," this maddening personality maneuver people often do on our kooky ol' planet. So I searched The Greville File (above), a little known databank of Thrival (the opposite of 'survival') Tips. "Passive-aggressive stuff happens when a person is not comfortable with being angry. They have often been moralized out of getting angry or being assertive about what they want. Or they were threatened, and their ability to fight openly for what they want has been suppressed." Und? "Anger is exhibited covertly; such a person can even hide it from themselves; but mostly, they turn the anger *on* themselves, put themselves down, and then get depressed and sad." More on Thrivalism, the opposite of "survivalism," from the Greville File (See Taurus). "After a while, everything we see in the world is painted with associations to impending disaster. The mind is fundamentally paranoid; and as a result, it is indulged to control the situation, to ensure our survival. We believe that if we keep running our minds fast enough, or good enough, we can control everything well enough to keep surviving. So the mind is fundamentally oriented toward avoiding disaster. Yet we have the ability to be conscious, so we can be aware, and when we do that, choices appear. And we can make choices. We can take options once we see them." Walking that line between being serious about life, which is essential, and taking it light, laughing and applying creativity first -- also skills which are also essential for sane living -- is not so easy, and that's where I see you now. The pressure you may feel to do to it right, to do it well, and the feeling that *you should have already done it before*, may be a bit much to live with comfortably. Yet we get more done being loose than being tight. You know that, and you also know how rarely your parents laughed out loud at work in their entire lives. Current aspects, as they develop this week, will help you break this particular deadlock. There is an Indian concept called "sumscara," which means "hidden past impressions." We live in a universe of these impressions, yet we barely notice. If you walk past a coffee shop, you are reminded of a person you met there, and may feel a longing for him. When you go home, every sight you see contains data about the past. There is even scientific evidence suggesting we carry the visual and sensory impressions of our parents in our minds, and can act in ways that are directly responding to traumas that they faced before we were born. The first way to be free of from this conceptual prison is to be aware. Notice what you are seeing, and what it means. Different ideas exist about the value of confrontation in close relationships. In many instances, though, the confrontation is centered on the complaint rather than in the relationship with the person (please see Taurus). "The expectation is that something bad is going to happen, and we're braced for it... one of us is gonna blow... and one's attention is then on controlling him/herself, and manipulating the other person. Even the idea that 'I've got to figure out the right thing to say or do' is fundamentally manipulative, treating the other person like an object. Establish contact with the person. Then everything changes. Say something simple and direct, look them in the eye, be with them, and stay with them... that contact is what creates trust." Who are you? Which you is really you? Is it your self-concept, or is it a deeper entity, a controversial aspect of Self known as the Soul? Or is the real self the one that is aware of the different selves? Can a person exist outside of the body, or without the body? If so, does that mean life is eternal? Are humans all related through a collective soul of some kind? And if so, where does individual existence end, and collective existence begin? These are natural questions that are likely to be on your mind these days. Meanwhile, your path through the world continues. Notice who you are at different times and different places. Notice who you are alone. In a few days, there is going to be a stunning conjunction between Jupiter and Mercury, but you'll have to get up about two hours before dawn, face toward the east and wait for it to rise, shortly before the Sun. I've found that taking simple little cosmic expeditions like this can have a brilliant effect on the way I view life. The world is quiet before dawn, and beautiful, subtle information about life is available. Astrologically, this aspect is about you learning how to have fun in your relationships. It's about making joy and light the first value you seek in your experiences of love. If you manage to get up to watch this particular shining of light, please share what you learn. We live in two worlds: the night world, and the day world. At night, the consciousness is not in the body (see Scorpio); but where is it? The questions you are currently facing in your two realities are very different. In one, you seem to be forcing issues around certain romantic questions, as if it were possible to cram the world, or another person, or yourself, into a little compartment of reality. In the dream world, you are working out many deep ideas about relationships, the value of marriage, and your secret notion of your ideal mate. Listen to those dreams. Try to tune into what is happening in both worlds, and see if you can start making some important connections. Aquarius is considered an eccentric, revolutionary sign, but it also represents the idea of crystallization. Notice how people have difficulty making changes in their lives these days. It's not that we don't have time; it's that the patterns in which we live have become so crystallized, we can barely break out of them. As time creeps into the Age of Aquarius, it becomes ever-more essential that we become free from our destructive cultural patterns. The negative pattern-makers (primarily corporations) are aware of this, and are racing to imprint as much data as they can to preserve things the way they are, because unless it changes, it will last. Yet with Uranus now slow and powerful in your sign, you are blessed with an extraordinary gift to crack open the old, and bring in the new. You can be free from the world around you. At the heart of existence is a question. Yet the mind is obsessed with creating information, explanations, concepts and doubts. The mind makes answers, and it questions those answers, playing an endless game while leaving the central question unasked. And yet this question that lives quietly at the heart of existence, unchanging, ready to pour forth its power and energy to those who simply acknowledge that they do not know, and let the question be a question. But remember the words of Nietzsche: "And those who were dancing were thought insane by those who could not hear the music." Link of the Week. Z Net, the web page of Z magazine. This is the place to get the information that you're not getting everywhere else, featuring a lot of otherwise unpublished articles by Noam Chomsky. Dreaming by Joan Mazza, MA (author of Dreaming Your Real Self and Dream Back Your Life). Shadow figures sometimes appear in our dreams. Carl Jung reminded us of the value of the Shadow. When we use so much energy to keep down parts of ourselves, we also lose a lot of our vitality and creativity that is attached to those aspects of who we are. You can't shut off your awareness and feelings selectively. When you go numb to protect yourself, that numbness takes its toll on other areas of your life. Your dreams are calling you to feel, and to wake up. Visit Joan's web page. Hausfrau Hints by Maria. Mopping. In old Europe, even today, we don't use regular mops. We use a brush with short, stiff hairs and a long handle. We cover this with a cloth dunked in hot, soapy water which is manually wrung-out by the hausfrau, which is why they are all so strong in old Europe (that, and from chopping the wood in Winter!). The floor is thus cleaned, and if there are stubborn spots, the cloth may be removed and the short hairs of the brush used to scrub. Remember to sweep first! And always use Meister Proper! Next week: Window washing. Man's Handbook by Mr. Ralph Higgins. I believe in a man's right to belch. It feels good to belch, and not only that, it's natural. It's healthy. If a man needs to belch, he must do it, even at the table; nature is calling. There are people who would deny a man a right to belch. But I'll tell you this -- belching has been around a lot longer than those prissy people who don't appreciate nature. Next week: Cigars. Garage band rock has been with us since the first schlubb picked up a guitar to imitate Chuck Berry. By the mid-sixties, the Beatles and the Stones were the inspiration. The results by 1966 were like watching a minor league ball game -- no prima donnas since no one is a star, they have everything to lose and one right stroke lands you in the big leagues. One flop and you're out in the streets. Then again, garage band rock is street music, rock in its purest form. Most garage band hits in the 60's were "three chord" rockers, simple beats fueled by perspiration, a love of rock music, lotsa hooks, cheesy production. "Woolly Boolly," "96 Tears," "Louie Louie" and "Gloria" spring to mind, but each region of the U.S. had its own garage band heroes, memorialized in multi-volume compilations like Back From the Grave, Nuggets and Pebbles. Bruce Springsteen grew up in the 1960's so he must have listened to and played his share of garage rock. It shows on his 1984 smash, Born in the USA, which includes "No Surrender," a gem that thankfully got no airplay since I'd hate it by now if it did. This song sums up the garage band ethos in words and spirit. Bruce celebrates the pacts his friends made to always stay together no matter what the world dished out. They "learned more from a three-minute record than we ever learned in school," which explains the lousy grades. Over Max Weinberg's crashing drums and rock-em-sock-em guitars, the Boss sums it up: "Now faces grow sad and old and hearts of fire grow cold, we swore blood brothers against the wind, I'm ready to grow young again and hear your sister's voice calling us home across the open yards, well maybe we could cut someplace of our own with these drums and these guitars." Anyone who grew up in the suburbs can relate; this is garage rock, 80's style. break them all with one song"), is for the ages. Of course, mention "garage band" to a rock historian and he'll think "Nuggets," the synonym for mid-1960's garage band "punk" that bridged the early 1960's with peace and love psychedelia. The story of "Nuggets" coincides with one of the early waves of rock nostalgia. The dust of the 60's had cleared by the early 1970's. Bands began showing off with drum solos, concept albums and lengthy epics like ELP's "Karn Evil 9" ("Welcome back my friends to the show that never ends") that emphasized musical virtuosity over rock and roll spirit. Rock star Lenny Kaye squeezed the best of 60's garage rock into a double album, "Nuggets", that reminded everyone why they started listening to music in the first place. "Nuggets" has long been out of print, but last year the folks at Rhino Records re-issued and expanded it to four compact disks offering shiploads of two-minute songs from obscure one-hit wonders and other bands that scraped along in every nook and cranny, from Stinkfoot, Arkansas to Boston, Massachusetts. It's all here: "Nobody but me" by the Human Beinz, "Time won't let me" by the Outsiders, "Double shot (of my baby's love)" by the Swingin' Medallions, "You're gonna miss me" by the Thirteenth Floor Elevators, "Little girl" by the Syndicate of Sound and "Liar Liar" by the Castaways, one the greatest songs in the history of rock and one of the best male-female vocal tradeoffs. Steve Bergstein is a civil rights lawyer. 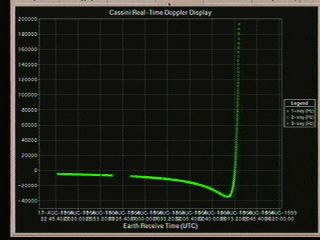 Moments later... NASA/JPL live internet video feed moments after the successful fly-by of the Cassini Space Probe. Graphic shows the speed of the craft, based on Doppler radar. Full story below... and full commentary at Burning Man. ....Scientists at NASA and the Jet Propulsion Laboratory successfully guided the Cassini Space Probe past the Earth late last night, sending it on its way to Saturn and avoiding a potential disaster in which 72 pounds of plutonium, used aboard the spacecraft to generate electrical power, could have entered the Earth's atmosphere. ....Cassini, which has cost taxpayers $3.4 billion to create and operate, was launched from Earth in late 1997, and its flight path took it on two orbits of Venus and then back to the Earth yesterday, in a series of maneuvers called "gravity assist boosts." Using the "slingshot effect," these maneuvers increase the speed of the spacecraft without using additional rocket fuel. Cassini approached Earth at about 35,000 mph, increasing its speed to about 46,000 mph by stealing a tiny bit of our planet's momentum. ....At its closest point over the South Pacific, the probe came within 727 miles of our planet, and was visible from Easter Island and Pitcairn Island. Relatively late in the mission, probably as a safety precaution, the government decided to increase the fly-by distance from about 450 miles to 725 miles; the actual distance was just slightly more. ....To accomplish this "flyby" maneuver, NASA had to risk accidental re-entry of the remote-controlled vehicle into Earth's atmosphere, which would have burned up the spacecraft and vaporized its payload of deadly plutonium, spreading it throughout every continent. Seventy-two pounds of plutonium is enough to give 34 billion people lung cancer. According to Dr. Helen Caldicott of Physicians for Social Responsibility, it takes only one-millionth of a gram to induce the disease. Current Earth population is estimated at about 7 billion. ...."This is more plutonium than has ever been put on a space device, and also with no good reason," investigative journalist Karl Grossman said in a Planet Waves interview Tuesday. Grossman is a full professor of journalism at the State University of New York. ....The national media was all but silent on the issue yesterday, and only a few scant stories have appeared over the months. Most people got their information about Cassini over the Internet (see the Planet Waves index of Cassini websites). Grossman has won nearly a dozen awards for his coverage of the nuclear space program, including Cassini, from Project Censored, a university-based project which calls attention to issues ignored by the national media. he is author of the book The Wrong Stuff, an exposé on necuear space shots. ....Grossman said that there are alternatives to using nuclear power in space. "Europeans right now are readying the Rosetta space probe to go beyond the orbit of Jupiter and rendezvous with a comet using advanced solar panels. At a distance of 675 million kilometers from the Sun, Rosetta will use solar power to generate 500 watts of electricity, while NASA is using plutonium to generate 745 watts of electricity at a similar distance, and at the same time threatening life on Earth," Grossman said. ....Advances in microtechnology will allow components to function on less and less energy in the future. ...YYet a report by the congressional General Accounting Office documents NASA's plans to use plutonium on eight more similar shots despite the advent of advanced solar power. "They're going to do it again and again until they get it wrong," he said, referring to the inevitability of a major disaster at some point in the future. It was just over one year ago that NASA lost a milti-billion dollar spy satellite in a Titan rocket explosion -- the same kind of launch vehicle used to loft Cassini. ....An explosion on lift-off, or prior to the launch vehicle leaving the atmosphere, could contaminate large areas with plutonium. NASA environmental safety records indicate that it had plans to move the populations of cities if such a disaster occurred, or in case of an inadvertant reentry of the probe this week. ....Grossman became interested in the nuclear space program, particularly involving missions of the Space Shuttle, in the mid-1980s, but did not think it was an important story because the odds of a Space Shuttle disaster were estimated at one in 100,000 by NASA. ...."Those are pretty slim odds, which is why I didn't do anything, and the same reason that media today are either very quiet or totally compliant," he said. "Like the reporters today who are not doing anything, I just said, well, one in 100,000, that's not worth a story." That was until he was driving to work to teach an investigative reporting class at the State University of New York on Jan. 28 1986, when he heard on his car radio that the Challenger had blown up. ....Grossman knew that the Challenger's next mission would have been to loft the Ulysses Space Probe, which had 24 pounds of plutonium aboard, into space. He immediately wrote a front-page editorial for The Nation magazine called "The Lethal Shuttle." ...."NASA changed the odds right away," Grossman said, explaining that the agency suddenly decided chances of a launch accident were really one in 76, not one in 100,000. He said that a scientist working on Cassini has admitted to him that these odds are "pulled out of a hat" for public relations purposes and are really meaningless numbers. Chances of a flyby accident with Cassini last night, for example, were estimated by NASA at one in 1.2 million. ...."It's scandalous. If there is another accident, it will be criminal," he said, adding that of 41 space nuclear shots by Russian and American space agencies, there have been six accidents, the most serious one over the Northwest Territories of Canada in 1978, and the most recent in 1996 involving a Russian Mars space probe with plutonium on board broke up over Chile and Bolivia. "Accidents have happened, and you can expect them to continue to happen." Eric will be doing astrological process sessions in central Florida in late September and early October. For information about availability in Tampa, Orlando, Miami and Ft. Lauderdale, please e-mail me. There are generally two ways to define ourselves; one is to do so against something else, and the other is to create an independent identity based on personal values, ideals and beliefs. At times, both are necessary, and while we often criticize "reactionary" people and politics, it really can be quite valuable to have someone or something against which to sharpen and hone yourself. For the moment that process is finished for you, and it's important that you do as much of your reality-checking and establishment of your ideas as internally as possible now, holding to what you feel is true and not backing down even if, for example, you find that people suddenly start to agree with you all over the place. That doesn't matter; what you think does. Be prepared to stand up for what you really believe in, especially where a close personal relationship is concerned. Most so-called humans walking the planet's surface are pretty much ready to roll over and drop dead at the least threat of confrontation. When people exhibit strong emotional reactions, they are less often genuinely upset about something legitimate and more often trying to manipulate others. While you sensitive-types are often willing to give people the benefit of the doubt, this would be a good time to assume that the motives behind any outburst are far from wholesome, and not designed in your best interests. Your words and your ideas are gold. Each and every one of them, and right now, not in some starry future when you make it onto the New York Times bestseller list or win awards for your brilliant design concepts. Every career is built slowly, but there are those moments when amazing things are possible, and this is one of them. So pay attention to your ideas; write them down; record them; listen to yourself. If no one has ever taken what you say or think seriously, it would behoove them to do so now. And if you're already attaining some success in a career involving your brain, this is surely your moment to shine like the Sun. You will have to trust that a certain long-stuck door involving your relationship to personal wealth has indeed opened. But I don't suggest you sit around waiting for the results; rather, take this rare opportunity to begin your side in the process; for example, setting up some kind of savings plan, which is merely a container to accumulate your financial gains, which are ever the mercurial (fast-changing) substances and need help becoming stabilized. I also suggest beginning a program of raising your prices, ceasing to do work for free (especially for people whose petty cash fund exceeds your rent) and making long-term plans for the way things ought to be, and in truth, are likely to become. These could be some touchy weeks coming up for you, though I suggest you not take your state of heart or mind too seriously. There is very little you can do about the current situation but accept it for what it is, and besides, what's really unfolding are a series of major internal adjustments in the wake of last week's total solar eclipse in your birth sign. Remember that life is a process that unfolds over many years, and that at the moment, you are compensating for and catching up from some kind of inordinate delay. At such times, we can feel very insecure, but really you have every reason to trust life. You can expect an unpredictable and at times difficult few weeks where matters of personal security and emotional well-being are concerned. Yet there are, as always, at least two ways to utilize the energies indicated by astrology. One is to get trapped in the stresses of potentially difficult aspects, and the other is to attend to the healing and development processes they are indicative of. Rather awesome progress is possible for you, if you will only address your anger consciously, refuse to let the past define the future, and consider the value of doing something not so typically Virgo -- dreaming of the new possibilities. No matter how preoccupied with personal matters you may be at the moment, put anything unpleasant out of your mind and clear room in your calendar for social affairs, which I suggest you attend even if you're not feeling quite up to it. Success is very much at hand, and to make success real, you're going to need to show your face. What you have accomplished so far is more impressive than you imagine, but remember that in most professional affairs, who you are is far more important than what you have done. Even if you were to understate your achievements, you would still sound quite impressive, so just be you and watch what happens. The next few days will represent a kind of test of your growth in the part of your life you consider "spiritual." Now, as far as I am concerned, there are not many valid distinctions between what is spiritual and what is anything else, but there are those aspects of being that we do consider relating to the progress of the soul's or the higher self's journey, and right now you are seeing how they operate in real life, and in real time. Given the choice, do you forgive, or condemn? Given the option, do you hold on, or let go? And knowing there is a difference, do you allow your emotions to run your life, or do you rely on your feelings? You are working up to something, and part of that working-up involves dealing with fear. A big part of the recent eclipse process has been throwing open doors that certainly have the potential to allow thundering blasts of power into our dimension of reality, and power makes Wee People very nervous. Yet it's also true that on Earth, there seems so much over which to worry or freak out. Now is the time to work with your fear, because your fear is a very important teacher in that it will reveal the true inner workings of your mind as they least serve you. Deal with fear now and power will be a lot more comfortable when you suddenly figure out you have some. It's important that you take this time as an opportunity to sort out the differences between what you value and believe, and what others value and believe. This is an exercise considered daring, dangerous and thus rarely performed by members of our stupendous culture, but I assure you, it will serve you very well to make some clear distinctions between what others think is best for you and what you know is important to you. The fact that they "know" and that you are "experimenting" is irrelevant. They don't know, and life is a process of trial and error, and powerful people have an obligation to assist those who are aspiring to better things -- especially if those powerful people claim to love you. I got some interesting mail from an Aquarian reader who said that she was disappointed that the recent eclipse didn't do much to help her strained relationship. "Everything I read said that the situation should come to a head and be resolved during the eclipse period, but nothing's happened yet. We're still going round and round. Am I being impatient? I thought that with us being an Aquarius and a Scorpio that we would definitely see something happen." My question for all Aquarians: Are you really, truly and with a blazing heart expressing your independence in this life? Are you really doing what you want, and what you need? For only from this perspective is any real resolution possible; compromises are not. It's essential that you work very efficiently right now, doing what you do well even better, not wasting time and making plenty of space and time to reflect and cultivate some of the new processes that have recently gotten under way. This is a time of changing routines for you, and one of the new ones I suggest you add is something known as time to think and feel. We are assured by all kinds of social philosophers that in our age, this is impossible, and that Westerners are so messed up we are incapable of pausing. But you are not incapable, and if you take the time, the rewards, I am rather certain, will be astonishing. 4 camping cabins, fishing, handicapped accessible, hiking, lake.